Lori Sutton dedicates her days to caring for animals from all across Central Queensland. LORI Sutton could not put a number how many marsupials have called her Clermont residence home over the years. But for the local wildlife carer, housing sick, injured or isolated animals is all in a day's work. For more than 12 years, Ms Sutton has cared for animals including koalas, kangaroos and birds, and said while her volunteer role took passion and patience, she would not have it any other way. "It's literally like going back to human babies, they are just as much work," she said with a laugh. "You are glad to see them go because you have another three in line to come in. "They are coming in as fast as they go out." Ms Sutton said since resident Emerald carer June Ryan retired from her role, she had noticed more animals coming into her care, and that of fellow Clermont carer Cheryl Currie. "We cover quite a large area; Emerald, Clermont, Dysart, the Gemfields, Moranbah, up to Mackay sometimes, so we do range quite a bit," she said. "I go on lots and lots of road trips." 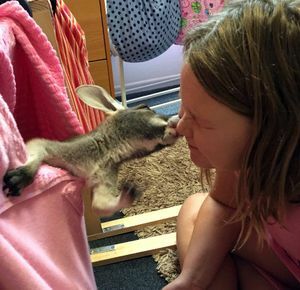 Two of the four bedrooms in Ms Sutton's home are packed with pouches for joeys, from "pinkies" to about one-year-old, to help them grow healthy before release back into the wild. Care does not come cheap, but Ms Sutton considered the money from the family's pocket a "donation to society". "People don't understand we buy 20kg of Wombaroo milk every three weeks to a month ... it's about $400 every month." >>Take it to the vet, they will have the wildlife carers' numbers. >>If you are unable to get to a vet, keep it somewhere secure, quiet, dimly lit and warm until you can get to a vet. >>Search the internet for a wildlife carer in your area, or call your local vet.